Dr. Cavalheiro received his Medical School degree in 1981 from the Faculdade de Ciencias Medicas de Santos – Sao Paulo. He completed residency in neurosurgery and post-graduate training at Paulista School of Medicine – São Paulo in 1987. In 1990, he did his post-graduate doctorate in Marseille – France training under Professor Maurice Choux – Hospital Des Enfants de La Timone and received a foreign assistant certificate Aix-Provence II in 1991. Chief of the neuro-oncology surgery department at Pediatric Oncology Instituto in 1999. In 2007, Cavalheiro was named Chair and Full Professor of the Division of Neurological Surgery at Paulista School of Medicine – São Paulo. He has 89 indexed papers and three books, and more than 25 books chapters. He has received 19 awards from around the world. He has presented 205 papers in congresses. He has supervised 8 works of scientific initiation. He has councelled 20 pos graduation students of Master degrees and doctorade at Paulista School of Medicine – São Paulo. 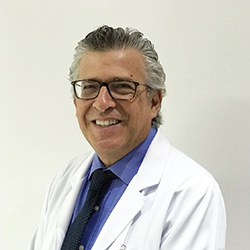 He is an active member of the International Society for Pediatric Neurosurgery, Brazilian Society of Neurosurgery, Brazilian Society for Pediatric Neurosurgery. Latin American Society for Pediatric Neurosurgery. He has great experience in fetal neurosurgery and has opetared more than 1000 patients with myelomeningocele. He has been idealizer of the use of intracystic inteferon for craniopharyngiomas in 2002. Has great experience in surgeries of tumors of brainstem and neuroendocopy procedures.